I believe in Proverbs 23: 7. It says, “For as he thinks in his heart, so is he. (NKJV). I believe what we think can and does change our life. 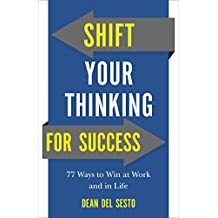 So when I had the chance to read Shift Your Thinking For Success by Dean Del Sesto, I thought it would be a good fit. And I was right! There’s so much wisdom in this book, this book should be offered to anyone who wants to be or needs a life coach. In fact think of this book as a life coach in a book! The subtitle of the book is 77 ways to win at work and in life. A lot of the information is just good old-fashioned ideas–something that’s in short demand today. But also a lot of it fits in with today’s thinking on branding and how to best use that branding in your business and private life. For example the 9th way to win is all about integrity. It goes on to give 25 ways to have more integrity. Those 25 ideas alone are worth the price of the book. Another winning way talks about relationship over agenda. Another talks about preparation. Many of the ideas are not new but they are needed. This book is a great way to jumpstart your career and your life. This book is a definite 5-star book!